Forum › Fur & Sheep › Lambing update..
May 9, 2013 | 08:41 1 Well, fourteen days into lambing, and my great big flock of 12 is almost done. Only two left to go, and one looks like she's going to do it today. So far I have 11 lambs from 10 first time mommas. Had to pull three. One was backwards, and a pretty big boy, so we got him out asap. Two were coming with one front leg back. The first one wasn't too far along, so I pushed him back in and got the leg. The other one was late last night, and he was too far out to be pushed back in. He was out to the shoulder, so I just pulled him like that. Only took a minute, and within ten minutes he was up and walking. May 9, 2013 | 08:51 3 Bravo! Looks like nice digs for lambing. We have the first group of 50 plus sheep and asscociasted lambs born in Feb and March out on pasture now and the second group of sheep is now underway with about 15 lambs on the ground. It took me three days of hard slogging to get the barn cleaned - even with a skidsteer there was a lot of small area stuff to clean out by hand - not going to do that again. Fortunately the cattle have completely finished calving so we are now resorting to sitting on the front deck and using the binos to check on most of the sheep. Only 20 left in the barn to lamb so I have to walk there a few times a day. All in all a pretty decent start to the year - now - if only we can get the price up! You have the start to a very nice flock of sheep. Keep going and in about three years you can be a powerhouse with a few hundred on the ground making lambs every year! Your profitability will make you THE money maker in the house! I laughed when my wife initially said that to me - now I realize it is true. May 9, 2013 | 15:31 4 Thanks. We took the calving barn, slapped up some sheep panels, and were good to go. I doubt if any lambs could have survived without that barn. Even starting at the end of April, we've had several good snows, and lots of cold windy nasty weather. It's been crazy. I'm really happy with these sheep. The originals are Canadian Arcott, and then I got six Dorsets to add to them. There are some benefits to starting with pail fed lambs that I didn't think about at first. The best one is the quietness of them. If I want to move them, I just call and they follow. They'll make good leaders in the future. The Dorsets are not so co-operative. Actually quite flighty. But they follow the quiet ones, so it works. base. I have never seen people NOT shear in spring. You see this frequently? I have hair sheep, so for me, shearing is moot. the year unless they don't grow much wool. May 12, 2013 | 08:26 9 They were sheared on April 7th. About three weeks before they were due to lamb. That's a three week growth of fleece on them. It's nice to see what's going on under all that wool. Makes it easier to monitor their body condition too, just in case someone was getting thin. As a handspinner, one reason for shearing just before lambing is to avoid the "break" that can happen in the fleece under lambing stress. Any kind of stress, from sickness to lambing can cause a weak spot in the locks, and basically ruin the fleece. I've seen broken fleeces before, and they're only good for compost. May 12, 2013 | 21:44 11 Talk about jumping in at the deep end! Holy Smoke! By the end of the first week, he should know everything there is to know about lambing, because he will have seen it all. May 14, 2013 | 14:45 12 We run a fair number of sheep and will shear at any time of the year. The thing to remember is the animals need to be inside if shearing in Nov - through May. Timing for shearing can always be adjusted to assist with lambing ease. Scoring through fleece is simple once you get the hang of it - just takes a bit of practise. Personally we never tip a sheep over for any reason - especially for shearing - if she is within 6 weeks of lambing. 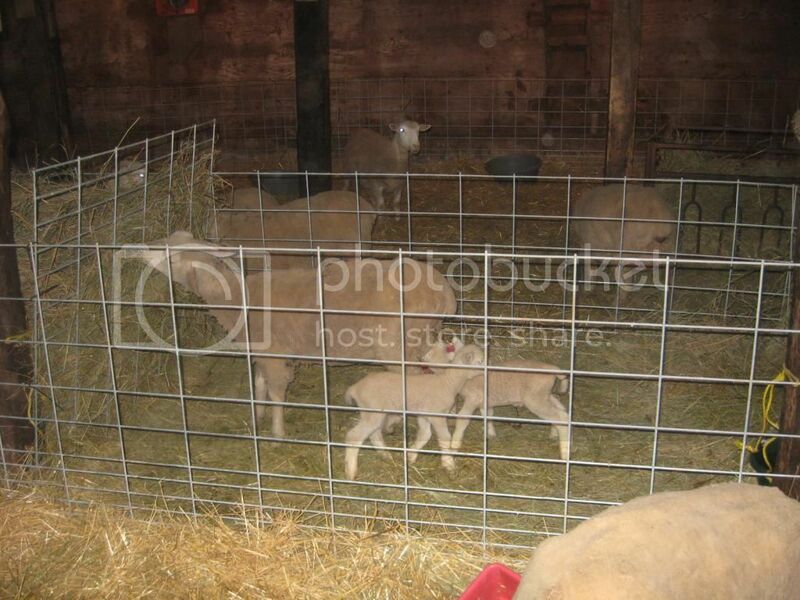 May 15, 2013 | 18:51 14 1600 sheep - all sources - lambing as a beginner? Wow! We have been here for a couple of years or so but I would not even consider this unless I had a lot of help - and some serious knowledge - plus an excellent management plan. I wish him all the best. you need to reduce your numbers accordingly. May 23, 2013 | 23:23 16 Update.. all done lambing. The last one lambed today. Eleven lambed in 15 days, then there was almost two weeks until this one. They were all first timers, so I'm thinking this one wasn't cycling when the ram went out. The score is 13 lambs from 12 ewes. Six rams lambs, and seven ewe lambs. Next year I'm expecting more multiples, but seeing how hard the one with twins is working this year, it's probably just as well they mainly had one each for the first round. May 24, 2013 | 20:50 17 Finally I can also update. Thanks for the update, kato. was emotional for me, and exciting. The ewe lamb I thought until last week was not bred, had a single little lady. least. Healthy little singles are better than nothing! Seeding and lambing is quite a thrill. well, and our ram was prolific as heck. May 25, 2013 | 07:11 18 HI everyone I hope lambing has gone well for everyone,as for us we only have five to go out of sixty.We had thirteen sets of twins so far and out of those we had to give two lambs away because their mothers only wanted one but overall its gone quite good.I WAS curious about what breeds you guys all have and why you chose them as I am still trying to find the best combination of traits that suit our situation yet try and be as profitable as we can ;any input appreciated,thanks and good luck. Jun 1, 2013 | 14:55 19 Half of mine are Canadian Arcott. I must admit I chose them because I liked the way the flock they came from operated. I figured it was best to start with something that had come from a flock where culling was a priority to remove problem sheep. Their mothers had to earn their keep, and it turns out they follow suit. The other half are polled Dorset. They came from a flock of the most uniform sheep I saw all last year. In fact, there are four out of the six that I still have trouble telling apart from each other. I guess my idea starting out was leaning more toward getting good sheep, than worrying about what breed to get. So far it seems to have worked. The Arcotts are a prolific breed, and fast growers. The Dorsets are a bit bigger, and I am loving the lambs they produced with the Arcott ram. I will post pictures when I get a chance. They're growing like weeds, and have changed a lot since the first pictures.